Excessive use of alcohol contributes to as many as 10% of deaths that occur among people between the ages of 20 and 64, according to CDC. When a person has too much to drink, they are at risk of some serious side-effects, including vomiting blood. Throwing up blood after alcohol is considered a serious complication and requires urgent medical attention. The underlying cause needs to be determined promptly, and appropriate actions need to be taken to address the issue at hand. 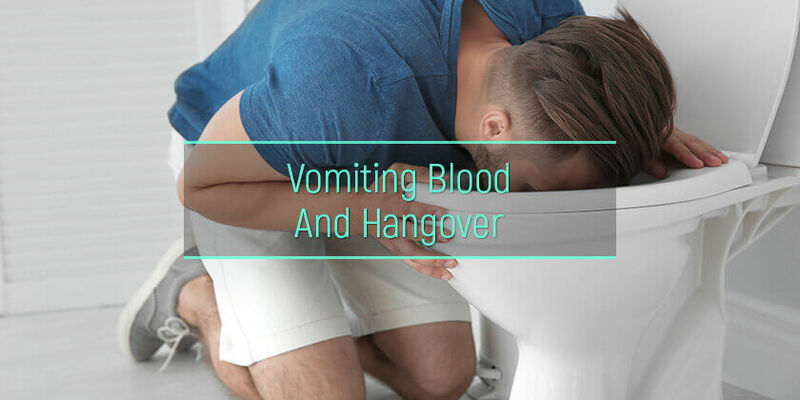 Patients should also realize accompanying symptoms that may indicate a serious problem and understand how to act when throwing up blood after a night of drinking. How does hangover cause vomiting blood? What are the signs and symptoms of vomiting blood after alcohol? What are the possible causes of throwing up blood after drinking alcohol? What are the dangers of hangover throwing up blood? What to do if there is blood in vomit after drinking? While some people complain about feeling sick after drinking small amounts of alcohol, a more substantial amount of alcohol can lead to much more than just a sick feeling. Throwing up blood from alcohol is potentially serious and even possibly life-threatening complication. The issue is often caused due to the irritation that alcohol imposes on the lining of the gastrointestinal tract. Alcohol also increases acidic content in the stomach, which can further harm the lining of the stomach’s wall, along with the lining of the esophagus. With excessive alcohol usage, the irritation becomes severe, which can lead to the development of bleeding sores (ulcers), as well as ruptured blood vessels. The most obvious sign of alcohol and throwing up blood would be the presence of actual blood in a person’s vomit. In some cases, however, it may not be as clear as one would think. Some patients who experience complications due to the excessive use of alcohol may rather experience a symptom such as black vomit after drinking alcohol. It is also important to consider additional symptoms that may indicate the presence of certain complications, such as abdominal pain and fainting. At the same time, a patient should be acknowledged with hangover side effects and not confuse these with symptoms related to possible complications that might have been caused by the alcohol they consumed. Understanding why a person may be throwing up blood after drinking too much is important, as there are many possible causes for this symptom. Below, we consider some possible reasons why a person may be vomiting blood. Stomach irritation is a common issue faced by people – especially when we consider the combination of vomiting blood and alcohol abuse. The alcohol can cause the stomach’s lining to become irritated – this, in turn, may lead to blood collecting in the stomach. When vomiting, the blood will then accompany the throwing up. Even in cases when throwing up bile when hangover, blood may be present among the bile. Throwing up from alcohol, especially when blood is present, may sometimes occur due to using certain medications with the liquor. This is especially the case when the patient uses a type of drug that is known to irritate the stomach – combined with the irritation imposed by alcohol, bloody vomiting becomes more likely. Naproxen, ibuprofen, and aspirin are some drugs known to cause such side-effects. These drugs can also lead to erosive gastritis. As mentioned, alcohol is known to irritate the stomach. When combined with certain drugs, the irritation is aggravated. This can lead to the development of a condition known as gastritis, which is an ulcer that develops in the stomach. With irritation, the ulcer may bleed – when the patient throws up after drinking, and they may have blood in their vomit. Cirrhosis of the liver causes changes in blood flow. This affects how the fluid collects and flows in the esophagus. Veins in the esophagus may become enlarged, and this may eventually cause ruptured esophageal varices. The result may be vomiting with blood being present. Certain parts of the gastrointestinal tract may suffer a rupture with the irritation imposed by excessive alcohol usage. Parts that may be affected include the small intestine, the stomach, and the esophagus. Bleeding occurs with a rupture, which may be the reason behind blood in the patient’s vomit. With excessive alcohol, vomiting blood may occur – and this is usually considered a medical emergency since there are some potential underlying causes that may become life-threatening in certain cases. The underlying cause needs to be addressed. In cases where liver damage is causing the black puke after drinking, for example, not detecting the issue early on can lead to permanent damage to the patient’s liver. This may eventually require liver transportation or even a hangover death. Conditions such as gastritis and a rupture in the gastrointestinal tract may also become life-threatening. These are much more serious that side-effects like hangover tremors. When drinking, throwing up blood always need to be treated as an emergency and a patient will need to be taken to an emergency room or a physician’s office. Patients are advised not to seek remedies on how to stop throwing up blood, but rather get to a trained professional who will be able to provide an official diagnosis on the condition. Any accompanying symptoms, such as a headache, dizziness, confusion, and pain will need to be reported to the physician for them to make an appropriate diagnosis and provide the patient with the adequate referral. Throwing up blood while drunk or the next morning is serious and can become life-threatening. Patients need to respond promptly to throwing up black after drinking to get the cause identified by a healthcare professional, as well as to obtain immediate treatment. Blood in vomit following a hard night of drinking is completely different than experiencing diarrhea from alcohol – and without treatment, it may cost the patient their life. If even such severe complications as throwing up blood do not prevent the person from drinking alcohol, that might be a warning sign of addiction. Consult the alcohol rehab specialist to learn more and discover the options for curing alcoholism.